Jenny of ELEFANTZ: Show & Tell Friday, a giveaway, and a sneak peek! Show & Tell Friday, a giveaway, and a sneak peek! 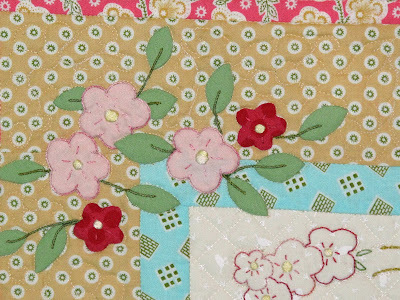 I have some lovely projects you've made using my designs to show you today, BUT, first of all I want to show off the 4th block from my 'in the process of being stitched' BOM, Daisy Days! ...and the itsy bitsy caterpillar! Would you like to win an Elefantz pattern?! Drop by her blog HERE to enter, but you'd better be quick! Last year I shared a free BOM over 10 months, "Promises & Borders". It's been a real blessing to receive photos and stories about how making this quilt, or some of the blocks, has made your lives richer. 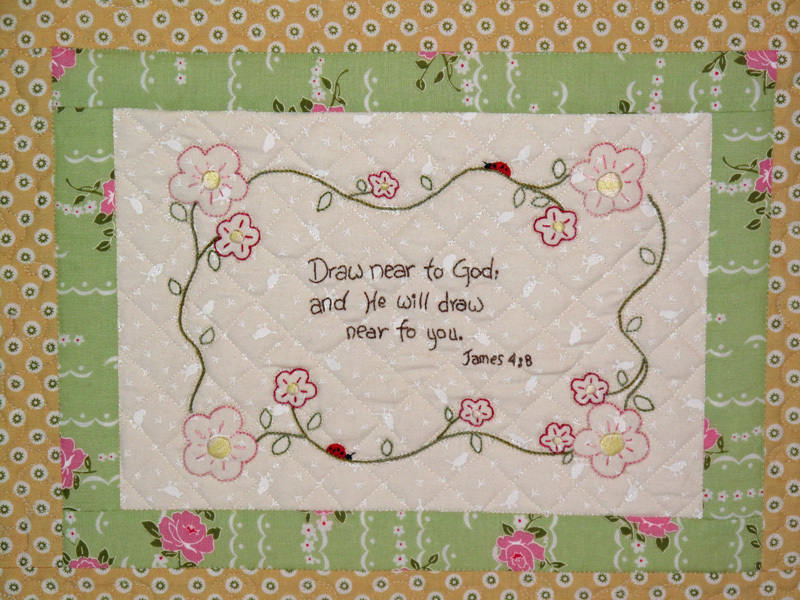 For some, quilts were made for friends going through extreme trials, and for others the individual block borders were used to mark weddings, anniversaries, or to frame a favourite quote or Scripture. ...and added applique to others. Making my design your own is exactly what I wanted with "Promises & Borders". You really did that, Lisa, and I love it! NOTE: Promises & Borders is still FREE to download! Just visit my 'Free Designs' page HERE. Noela Young is a long time Elefantz follower, and recently she sent me a photo of a present she made a swap partner. It was an Initial swap, and so she used my "Sprinkle Love on Your Heart" design, but added a beautiful S in the heart centre! Ladies, I love what you've done! Thanks for sharing your photos with us. What about you? Is there something special you have planned for this weekend? 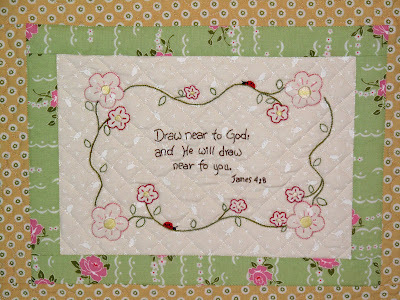 Your Daisy Days design is just gorgeous, Jenny. Have a lovely weekend. No Sewing. The grandkids are coming for a week.....grin. Já passei por lá,obrigada.Sou comentário (1). É uma delicadeza seus trabalhos.Vou para uma pequena viagem,volto no domingo .Aproveite seu passeio.Bençãos! Lots of great pictures! Enjoy your weekend. Ooo I do love visiting your wonderful blog as there is always something wonderful cooking! 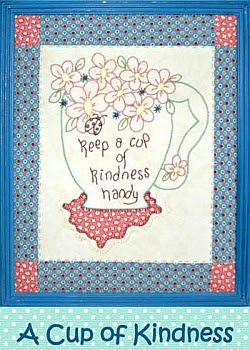 lol Your Daisy Days Pattern is gorgeous, I am looking forward to seeing it finished. love how the 'day-daisies' are growing. Not a lot this weekend hopefully a bit of sewing have a lovely weekend. Lots of lovely stitching Jenny, the daisy pattern is adorable! I love your BOM Daisy Days, Jenny. It is just so cute. It is going to be a quilt? I was thinking how prety it would be on tea towels. I also think Noela made a fabulous job on the Promises and Borders quilt. That is still on my to-do list. The problem is that this list of mine is so l-o-n-g now, it's quite over whelming!! I just have to take it slowly, coz then I will be put off because of how long the list is!! Love those pink polka dot rainboots! Lisa's quilt is beautiful! I just love those polka dot rain boots. too cute! The ruffle on the umbrella is so sweet too. cute bug! The quilt by Lisa is beautiful. I love how she added the same flowers in applique. Be still my heart...pink polka dotty wellies! I enjoyed the free BOM although I have not used all of them. Thanks for the link. I love seeing your beautiful stitching. I am hoping to spend the week-end sewing hexagons. I am making a tote bag with hexagons done in rows. Sew much fun.